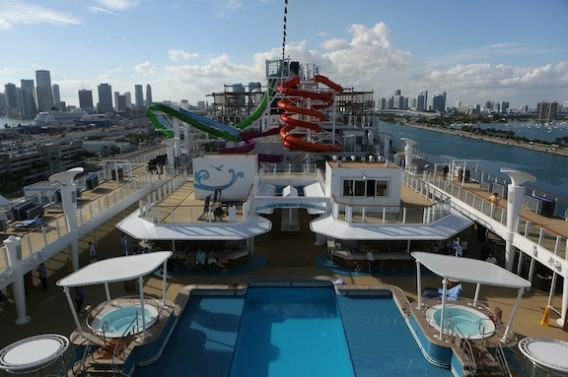 Norwegian Getaway, the largest ship to homeport year-round at PortMiami, has officially arrived in Miami and begun its first voyage. The ship began what will be a weekly schedule of seven-day cruises to the Eastern Caribbean on Saturday. The ship was christened on Friday with a ceremony including the Miami Dolphins Cheerleaders, Brooke Burke-Charvate and Miami-born musician Armando Christian Perez aka Pitbull. It is the first cruise ship to feature the “Grammy Experience at Sea,” which includes artifacts chosen and curated by the Grammy Museum, and performances of the musical Legally Blonde, among other amenities.